In the very early days of integrated circuit design, design rules were vastly simpler than they are today. In fact, back then, manual visual checking of the layout sufficed. As process technologies continued to shrink to smaller geometries, the relatively simple checks for spacing, pitch, overlap and other checks became too complex to analyze manually, opening the door for computer automation to be applied for performing the design rule checks. 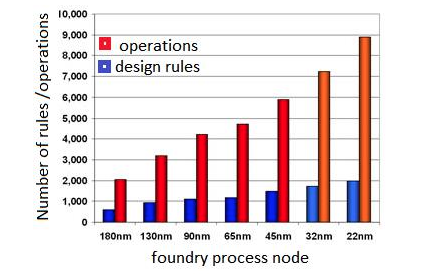 Design rule complexity is measured by the number of computation operations required to cover and verify the rule, if has grown faster with decrease of foundry process node. Taken together, these challenges demand the need for a high performance, highly accurate physical verification (PV) solution. 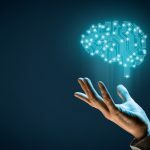 POLYTEDA CLOUD offers an innovative, natively flat solution to physical verification that overcomes and surpasses the limitations of the hierarchical approach. The One-Shot DRC technology is a proprietary architectural innovation in DRC processing that is the heart of the PowerDRC/LVS engine, the foundation of POLYTEDA CLOUD’s cloud-based solution for physical verification, PVCLOUD. One-Shot delivers a natively flat solution to physical verification as opposed to the hierarchical solutions employed by most other PV tools. One-Shot processing uses a window-based capability to verify a block of the layout, including all layers, and processesthe rules associated with them simultaneously. The windowing approach enables memory efficient processing and the size of the window can be controlled by the designer. Because the window size is known and performance per unit area is linear, runtimes are highly predictable. 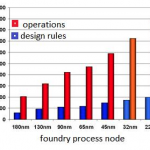 Runtime performance and capacity can be further accelerated by scaling to multiple CPUs. PVCLOUD will run on up to 128 CPUs in parallel to increase throughput and capacity. Today’s process geometries pack more devices into a smaller area which leads to more devices moving into the proximity of the immediate area being analyzed. Because of this, nearest neighbor comparisons are becoming the norm. As the design size reduces, the requirement for checking for proximity effects does not scale with it since these effects are based on physics. Therefore, more rules and parameters are required leading to the need to process more checks and rules within a given area. One-Shot processing is better suited than any hierarchical processing technology that handles a few layers at a time. The One-Shot DRC processing engine has a close to linear relational dependency between run time and input data size. Therefore, there is no need to rely on hierarchy to manage performance. The processing speed is directly proportional to the number of objects being processed and is constant for a given style of layout and process node. In other words, the performance is predictable. The One-Shot technology also delivers higher accuracy than hierarchical approaches. 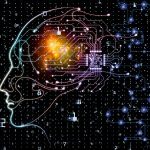 Processing is not limited by factors such as the many complex rules that span hierarchical boundaries. Instead, One-Shot’s all-layers approach delivers the most accurate results. 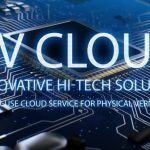 PVCLOUD has been optimized to deliver performance and accuracy over a wide range of applications and process geometries for semiconductor design while delivering the cost-efficiencies of cloud-computing. Process technologies supported include almost any CMOS, BiCMOS or other silicon-based process from microns down to 32nm. Ideal design applications include digital logic, analog mixed-signal, memory, silicon photonics, image sensors, rad-hard, and power management. POLYTEDA CLOUD is a good fit for many IoT designs that include analog mixed-signal and sensor technologies. Fabless design teams and design services companies developing ASICs, IP, and custom chips or layout blocks can all benefit from the performance and cost-savings of utilizing POLYTEDA CLOUD as their primary physical verification solution. Foundries can also benefit by providing their customers with access to POLYTEDA CLOUD and using it to in-house for qualification and design acceptance. The One-Shot technology makes up the core of PVCLOUD for cloud-based physical verification. PVCLOUD performs DRC, LVS, XOR, DIFF, FILL, RCX and text-based OPC operations – a full suite of physical verification capabilities. 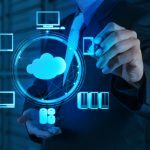 Within PVCLOUD the combination of One-Shot technology, multi-CPU processing and the PWRL language (a powerful rule language) deliver a complete cloud-based physical verification suite.